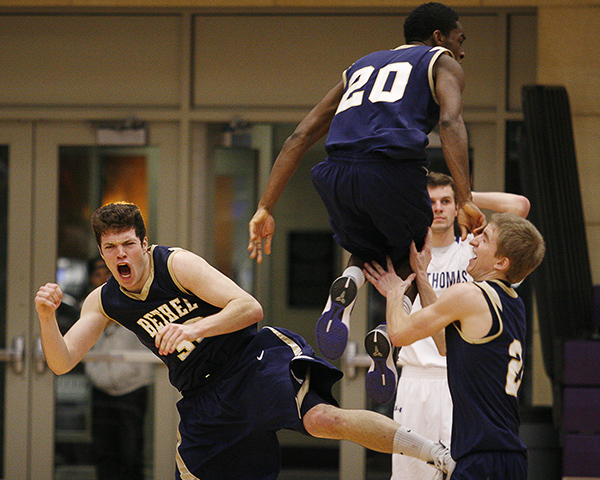 ST. PAUL, MINN. — Bethel guard Kel­lan Dahlquist (left), Daniel Baah, and Quinn Gors­ki cel­e­brate Dahlquist’s game-win­ning jump shot at the buzzer to de­feat reign­ing na­tion­al cham­pi­ons No. 20 St. Thomas Jan­u­ary 16, 2012 at St. Thomas in St. Paul, Minn. This pho­to was also used on D3Hoops.com.